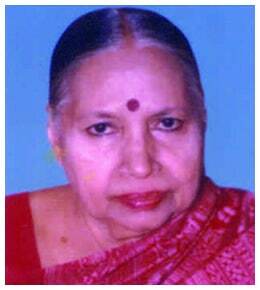 Ms. P. P. Gomathi was a dreamer all her life. She dreamed of a society in which there wouldn’t be any discrimination of any genre or shade. But she was too romantic a soul to realize that such a world resides only in the realm of imagination. She hoped that small steps each one of us takes in the right direction incrementally would take us one day to that ideal state. The way she fortified that belief against all the odds she faced in real life was with an unusually fervid commitment to her chosen field of work – teaching. Not surprisingly, she couldn’t realize her dream. But she left behind a huge circle of former students and acquaintances, their children and grandchildren, who would fondly remember for quite a long time to come the good work she had done and her belief in a less discriminatory society. She also left behind a wish, expressed in one of her casual conversations with one of us, the instituters of the TRUST named after her, that we should do something to alleviate the rabid discrimination seen all around, one of the most pernicious being the gender discrimination. We are hopeful that together, we would be able to do some justice to her wish. The most important programme of the TRUST is to support at least one girl at a time to secure a decent job and stand on her feet with honor. With the cost of higher education spiraling upwards out of control, what we decided to do, we know, is a drop in a vast ocean. All the same, it is such drops that make the ocean. We are sure that her well-wishers will appreciate this humble gesture as a sincere homage to her from all of us who had known and admired her when she was alive. She passed away on the 13th of October 2014. We hope her memory will remain verdant through what the TRUST proposes to do. Our basic aim is to support at least one girl to successfully complete a career course, which we shall start fulfilling from the academic year 2016 – 2017. 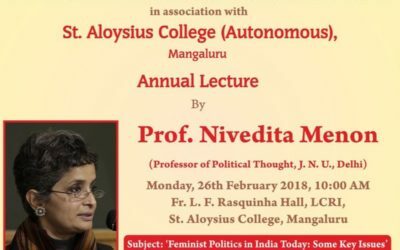 Ms. P. P. Gomathi, who had a very successful career as an English teacher in various Government Colleges of cities like Pallakad, Mangaluru, Bengaluru. 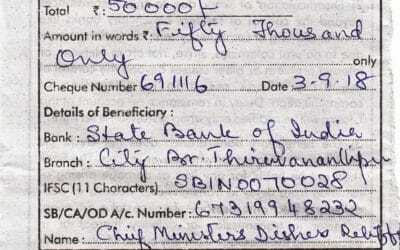 A amount of 50,000/- (Fifty Thousand Only) was donated by P.P.Gomathi Educational Trust to Chief Ministers Distress Relief Fund to help the victims of Kerala floods. 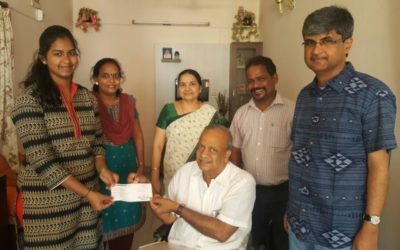 As a part of the scholarship programme cheque of 1,00,000/- (One Lakh only) was handed over to Ms. Supreetha Anand Byatnal as a scholarship for her education from the P.P, Gomathi EducationalTrust.